Three men are running for two seats in the next election to hit Maricopa. Though it impacts property owners in the city boundaries and then some, fewer than 250 people typically vote in board elections. The Maricopa Flood Control District is rarely in the spotlight, despite its purpose of controlling drainage and easing the impact of floodwaters, primarily through the Santa Rosa and Santa Cruz washes. Its duties and authorities are also important to Maricopa’s ability to grow. The city of Maricopa’s 2040 Vision process ruffled some feathers at MFCD. Other actions at the city level have also caused irritation, and all of that has made the Oct. 7 board election unusual. Of the three candidates, Bruce Neely is the only incumbent and the current president of the board. Dan Frank is a former city council member and chaired the 2040 Vision Steering Committee. Brad Hinton was formerly on staff at City Hall as the development manager and now works for El Dorado Holdings. Neely has been on the board for eight years. His family first bought property in Maricopa in 1953. “The reason I got on the board was basically because adjacent to my property a dike was being taken down, it was taken down 14 feet, and nobody knew who did it,” Neely said. Over the years, he has seen major floods that created many problems (1983, 1993) and smaller, persistent, inconvenient runoff. He has seen raw sewage in the district’s washes, and he has seen special interests intrude on logical decision-making. “There was a lot of the stuff we saw happening that was not good engineering,” Neely said. Engineering comes into a lot of discussions with the flood control district. “I think there is definitely a need here for somebody who is highly qualified,” Frank said. “There needs to be great oversight management.” Frank has worked as a civil engineer for 20 years focusing on drainage and flood control. Since the district was created in 1958, only 12 people have sat on the three-person panel. The district is responsible for maintaining 12 miles of drainage channels in Maricopa. Its boundaries have not changed since they were established in 1959. With the turn of the century, Maricopa land use quickly changed from farms to developments and houses, putting more work on the backs of the MFCD board. “It was much more than they ever bargained for,” District Manager David Alley said. MFCD is a taxing authority with the ability to condemn property and procure grants. It is maintaining a tax levy of $350,000. Though it has the highest assessed valuation among flood control districts in the county, it has the second lowest property tax rate. That tax rate just dropped from 0.2060 to 0.1964 per $100 assessed valuation. “Most people don’t realize they’re paying it, it’s such a small amount,” Alley said. MFCD’s relationship with the Pinal County Flood Control District and the city of Maricopa is vital to fulfilling its responsibilities. All three entities share the priority of protecting residents, but they do not always agree on the issues under that wing. Frank said a key issue for MFCD is public support. He said the district can be more proactive in educating the public on what the district does, what its limitations are and what it can do. The fact the 2040 Vision Committee listed flood mitigation among its goals showed it is an important issue, though Frank said “the wording could have been a little better” in identifying one of the city’s strategies as “Take control of the Maricopa Flood Control District.” Alley requested a change by the city council, but the language stayed. The wording had an unintended tone, Frank said, but it “stemmed from a lot of remapping” when the Federal Emergency Management Agency (FEMA) placed more properties in the flood plain. Frank said that was not MFCD’s fault, but there is a level of distrust that better transparency could resolve. City Manager Gregory Rose said the growth of Maricopa will naturally lead to the city taking more flood-mitigation duties. It is unknown how that will evolve in the next 25 years, he said, and there is plenty of time to work through the legal issues. Alley said he has heard some people calling the board members anti-progress, but he thinks that is inaccurate. “I’ve never seen that,” he said. “In 2003 we had a joint venture with Rancho El Dorado that basically sparked Maricopa’s growth,” Neely said. Because the land use changed from agriculture to housing so quickly, the board’s caution came from “just not knowing what to do,” he said. The board historically has been comprised of farm owners trying to be very careful with tax money while protecting properties and residents. “We want to run really lean and solve more problems than we create,” Alley said. The flood-plain status of many lots is a concern for developers, Hinton said. He said more work to remove more property from the flood plain will allow more development, more jobs and more population. He said some companies have not come to town because Maricopa “does not quite have the population base” they need. Hinton, too, said better communication between the city and the district is important in improving the relationship. Rose specified capital improvement projects as an area for better communication. Alley said MFCD’s main concern is the condition of the levy on the Santa Rosa Wash. A recent evaluation by the county resulted in question marks about its condition. Pinal County inspects the levy about every six months. It could cost $120,000 just to evaluate the situation. Losing accreditation on the levy would place a lot of Maricopa land back into the flood plain on the FEMA map. The city and district have a shared goal of getting more property out of the flood plain. While MFCD is focusing energy on the Santa Rosa levy, the city is set on North Santa Cruz channel improvements. “They don’t know it will work,” Alley said. He said there is potential for MFCD to be more heavily involved in projects on the Lower Santa Cruz and Upper Santa Cruz. Neely said the district has worked well with the Gila River community to form an agreement for flood waters to be carried to the reservation, if velocity is tolerable. Widening the wash is a point of debate. The election is Oct. 7. The Maricopa Flood Control District will begin sending out early ballot materials Sept. 11 for voters who request them. The last day to register to vote is Sept. 8. 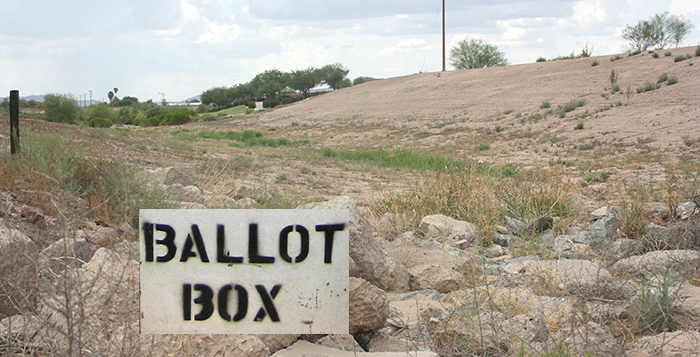 Voters must own property within the flood control district. For those who will vote in person, the poll is at 41630 W. Louis Johnson Drive and is open 9 a.m. to 4 p.m. When: Oct. 7, 9 a.m.-4 p.m.
Info: Contact 480-980-0531 for an early ballot by Sept. 11.